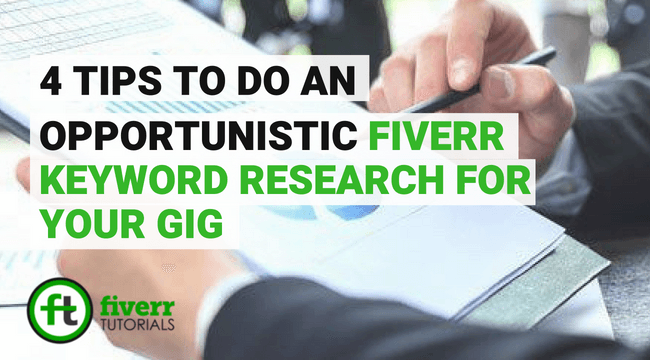 Doing Fiverr keyword research to optimize your Gigs is not an easy job. And the fact that Fiverr doesn’t suggest the keyword worth i.e search volume and competition etc., creates a lot more problems for finding best keywords nearest to your Gig’s focused keyword. So, finding best clump demands a high deal of manual research on Fiverr. You’ve to find the most searched keyword on Fiverr through manual searches and find the best working for you with lesser competition. In this Fiverr tutorial, we’re going to share some authentic ways to research your keywords for your Gigs! There are 3 methods that can help you do best Fiverr keyword research for your Gigs. Although these methods are well-explained in themselves but let us explain in a bit more depth so that you find no problem. All you have to do is enter your Gig’s focused keyword in the search field. As usual, you will find some suggestions based on most searched keywords on Fiverr related to your Gig. 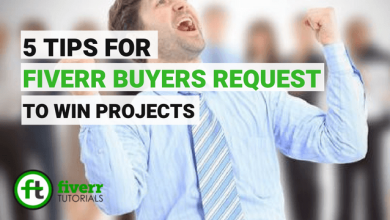 These are the terms used by the majority of the buyers while searching for a particular service on Fiverr. Your job simply is to keep note of those key terms and use them frequently in your Gig i.e. in Gig title, Gig description, etc. For example, your Gig is based on “Data Entry” keyword. you will simply enter the primary keyword in the Fiverr search bar and wait for the auto-complete to suggest you with the 5 most searched queries related to data entry. 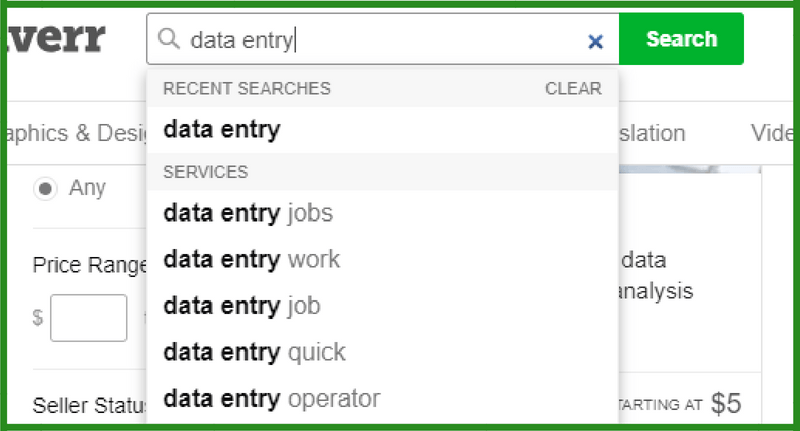 For example, in the above case, the suggestions on Data Entry keyword are “data entry jobs”, “data entry work”, “data entry job”, “data entry quick”, and the, “data entry operator” etc. Note down and play with these keywords in your Gig. For the search tags, it’s the same story. You will put your keyword and the auto-complete will guide you with the healthy keywords nearest to data entry. Obviously, you can’t use all of them either in the Gig and in the search tags. In this case, you should go with the most authentic or the keywords appearing on top of the suggestions. For example, if you’ve to select the 3 comprehensive keywords out of above 5. Without a doubt, you should opt for the first three ones. Because they are listed on top of the search results. Analyzing your niche competitors can help you find more opportunities to broaden your vision of maximizing the business. Similarly, you should research your competitor’s way of working and find the flaws and gaps you can fill. You can do this either inspecting their Gig titles, search tags, Gig description and the thumbnails etc. The alternate method is to use the Keyword research tool which does the same job as the above methods. Although, this method will also not allow you to guess the monthly search volume or competition on Fiverr, but might avoid you from the above two methods. 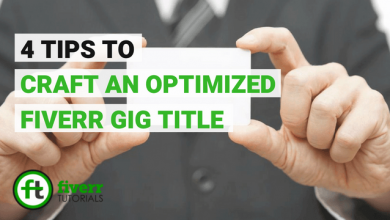 These keywords are really important in overall exposure of your Gigs. Obviously, it doesn’t mean that using the exact keywords will rank you on top. But there are numbers of other factors taken into account. If you look at the Fiverr algorithm on how they rank Gigs, you will come to know that they apply a very complex procedure to this cause. Make sure that you find the best, comprehensive and the most used keywords for your Gig. So, that you find more success in the search results when the Fiverr SERP rotates.